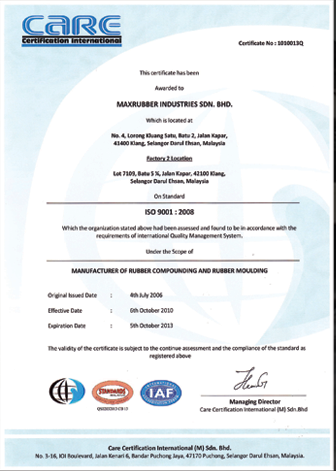 In its humble beginning of manufacturing automotive and industrial rubber moulded products, Maxrubber extended its core competencies and expertise into manufacturing of tyre retreading materials. Through a series of strategic investment into manufacturing upgrades and process re-engineering, Maxrubber aims to anchor itself as a reliable business partner and solutions provider to our esteemed clients in the retreading industry. Besides offering a complete range of innovative products that is required to enhance business competitiveness, Maxrubber offers essential technical and commercial supportive tools and services to ensure a sustainable growth. – the flagship brand of Maxrubber which offers top quality performance and value have expanded its horizons throughout Asia, EMEA and US market. Its revolutionary compound formulation and processing techniques have earned the trust of discerning fleet owners who values uncompromising safety, value and quality.